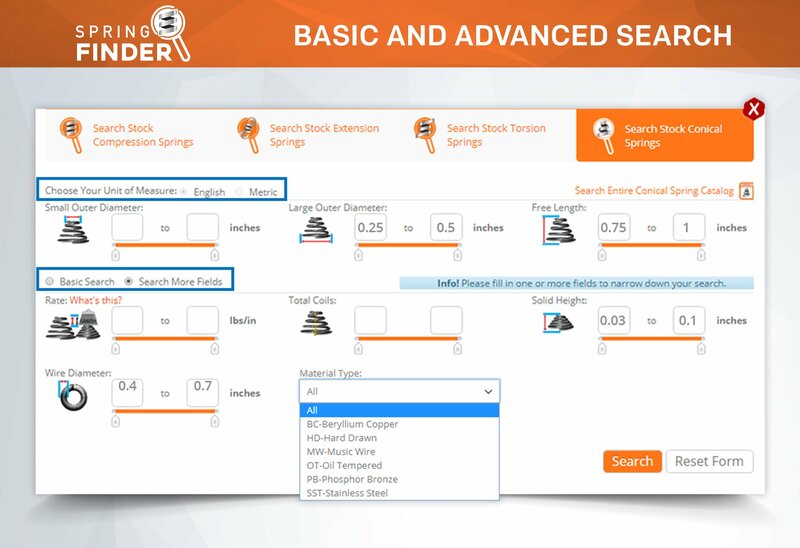 Definition: The Spring Finder is a metric extension springs selector for it allows you to search and select a spring based on its metric measurements. 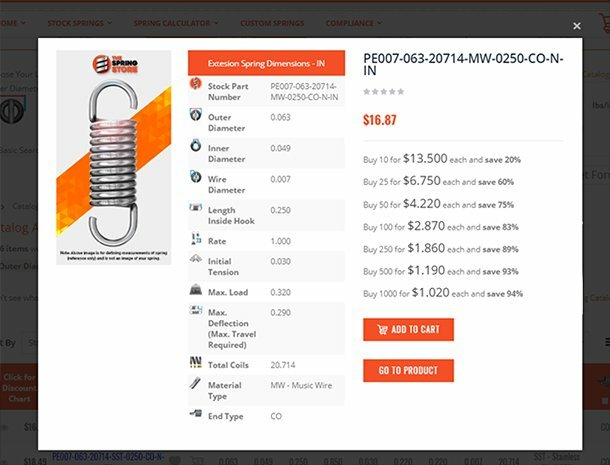 This metric extension springs selector is and advanced system which is programmed to provide you with extension springs that fall right within the parameters you need. 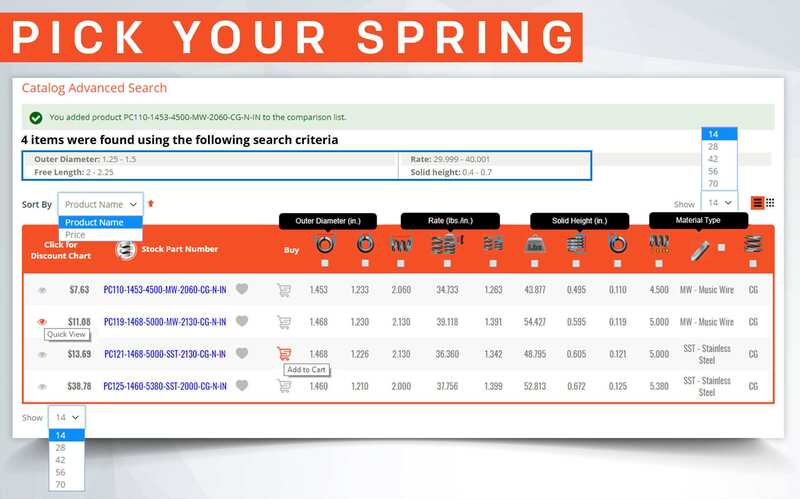 You may enter your extension spring's dimensions into the selector in either the english or metric units of measurement although it is automatically set up in the english units of measurement. 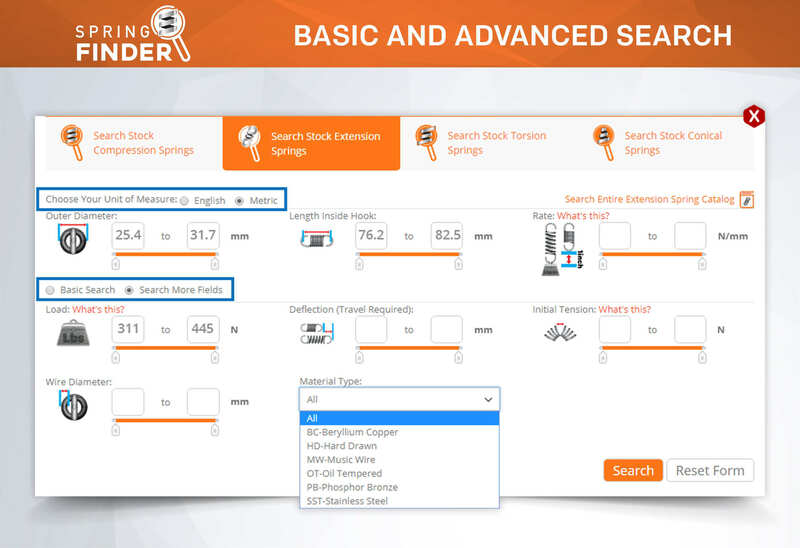 The units used for the metric extension springs selector are millimeters (mm) for measurements and newtons (N) for loads. The unit of measurement for metric spring rate is newtons per millimeter (N/mm). 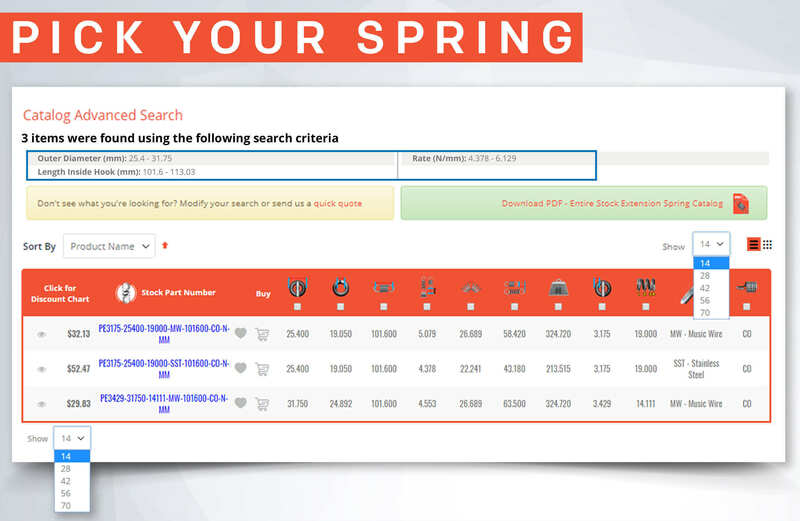 Our Extension Spring Finder allows you to decide which dimensions you want to base your search from. 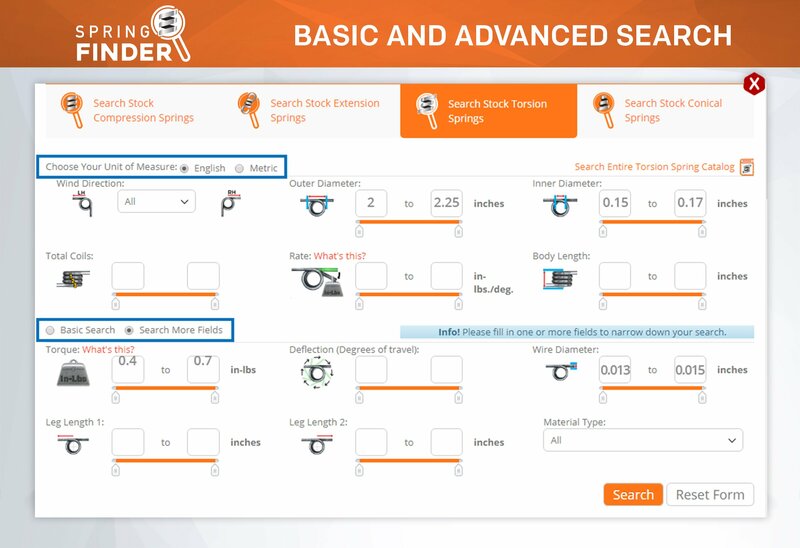 You could have very minimal information and you'll be able to find your spring. 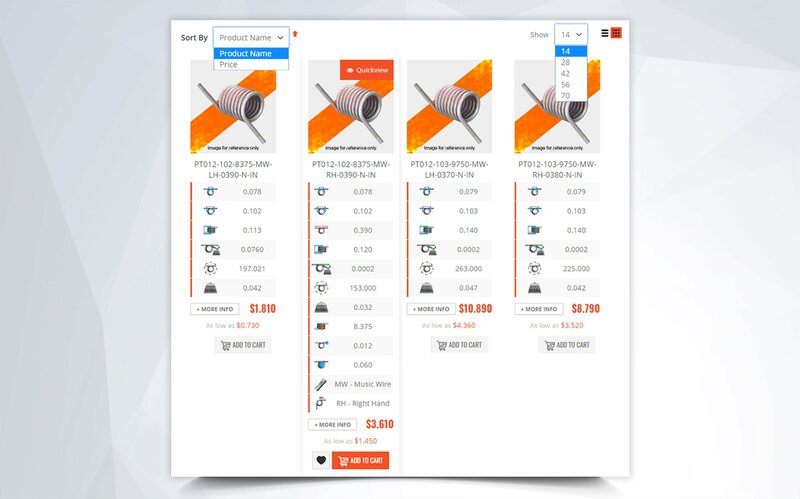 The fields given for you to choose from are outer diameter, length inside hooks, and rate; although you may click on the option to "Search More Fields" and also have the option to enter load, deflection (travel required), initial tension, wire diameter, and/or material type. 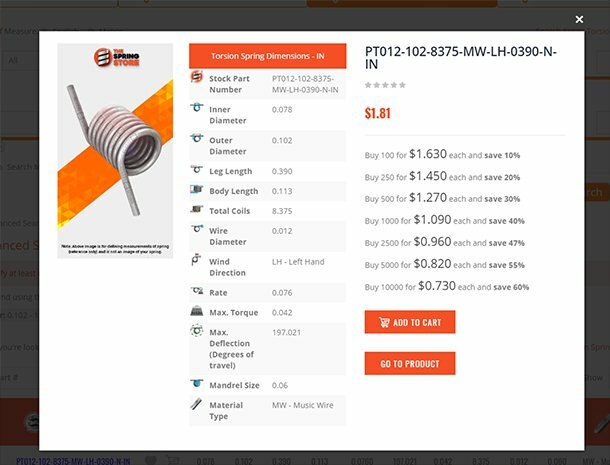 You may choose from amongst 8 material types which include; Music Wire, Hard Drawn, Beryllium Copper, Stainless Steel 302, Stainless Steel 17-7, Oil Tempered, Phosphor Bronze, or Chrome Silicon. 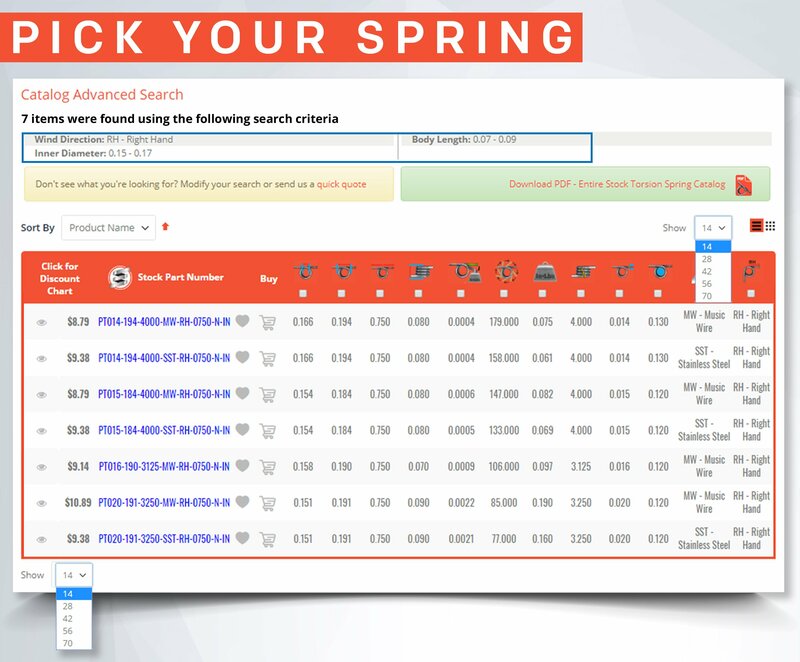 After you've filled out the fields you selected and clicked on the "Search" button, Spring Finder will automatically search through our catalog and select all of the standard springs that fall within your requirements. 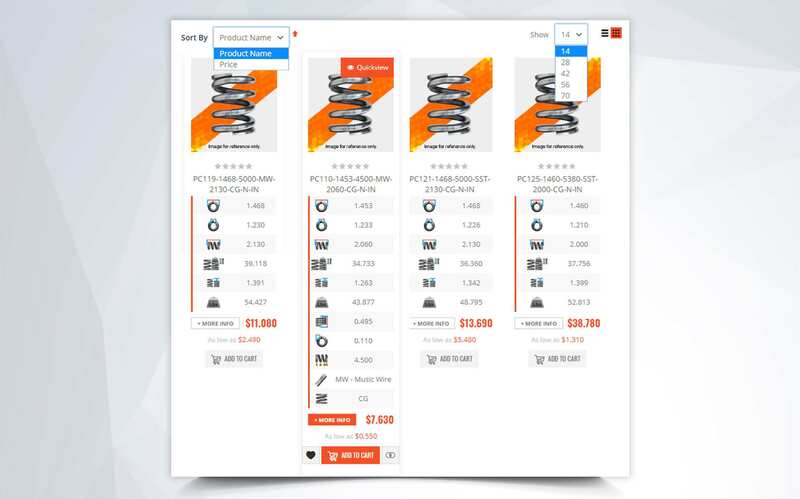 Then it will provide you with a chart that has all of the extension springs that meet your criteria. 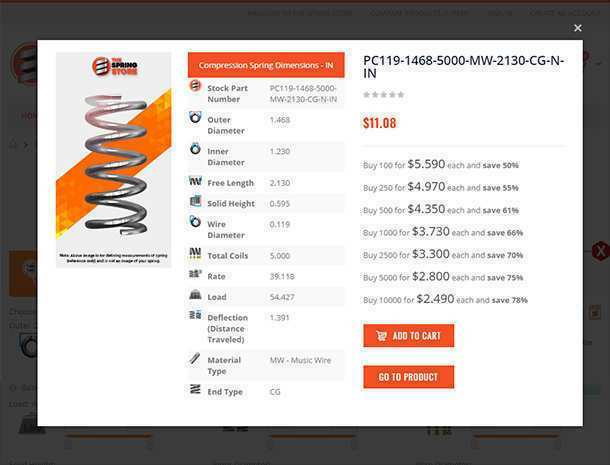 The first column you will see on that chart is the metric extension spring part number. 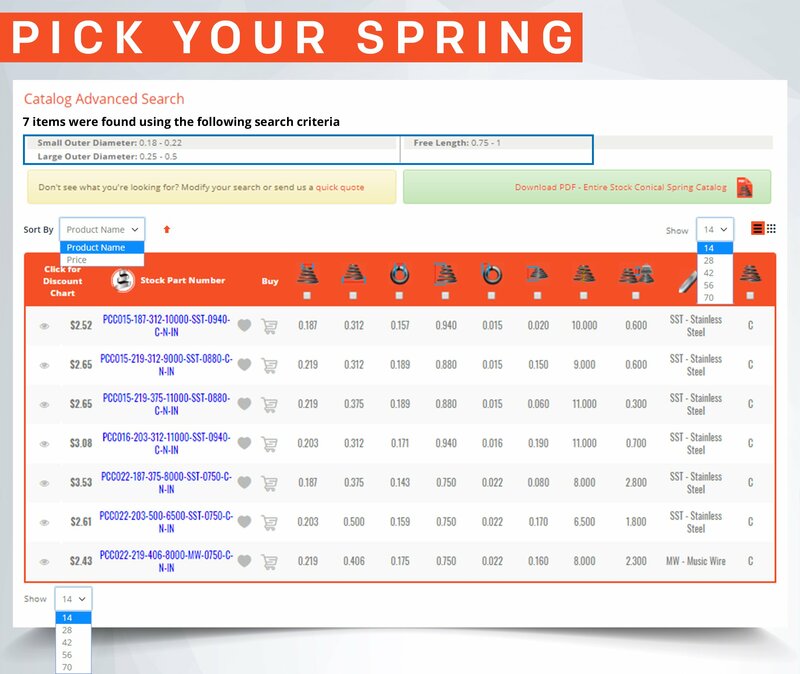 The metric extension spring part number consists of all your extension spring measurements in the metric units. 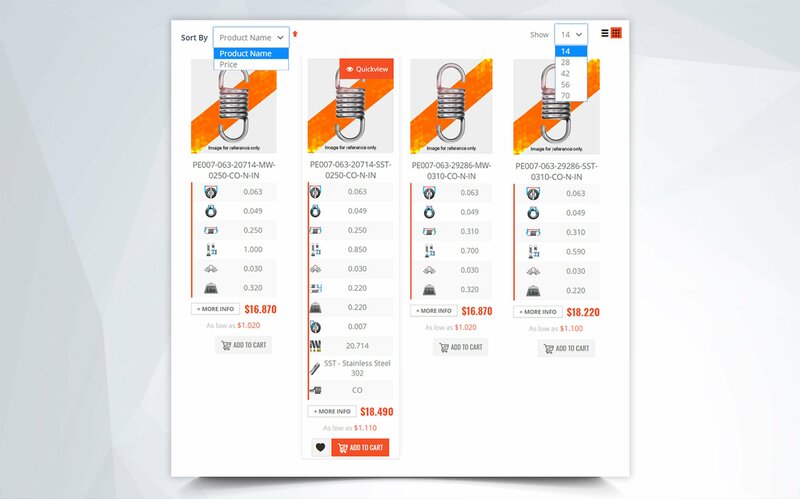 It also shows the material type, the end type, whether it is plated or not, what type of plating it has been plated with, and last but not least; it shows that it is in fact a metric part number with the last two characters of "MM". 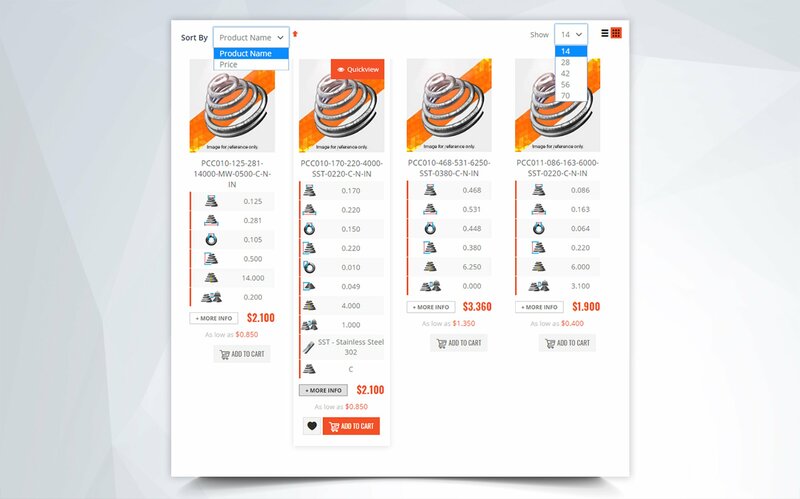 If a part number ends in "IN" instead of "MM" it is a part number in the english units of measurement. 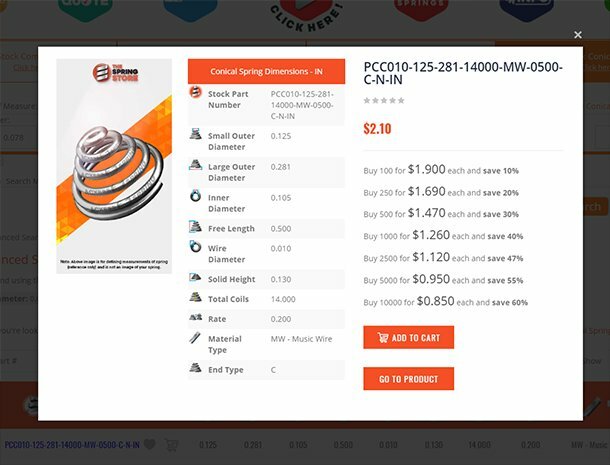 The next column provides you with the retail price of the spring although if you click on the part number, you will see a price breakdown for extension spring wholesale quantities. 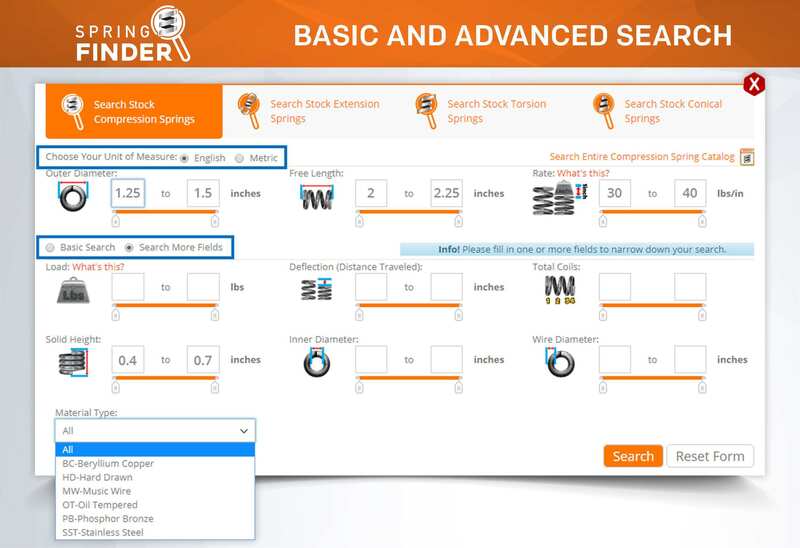 The rest of the columns show your extension spring's dimensions, rate, and elastic limits as far as suggested maximum load and suggested maximum deflection. 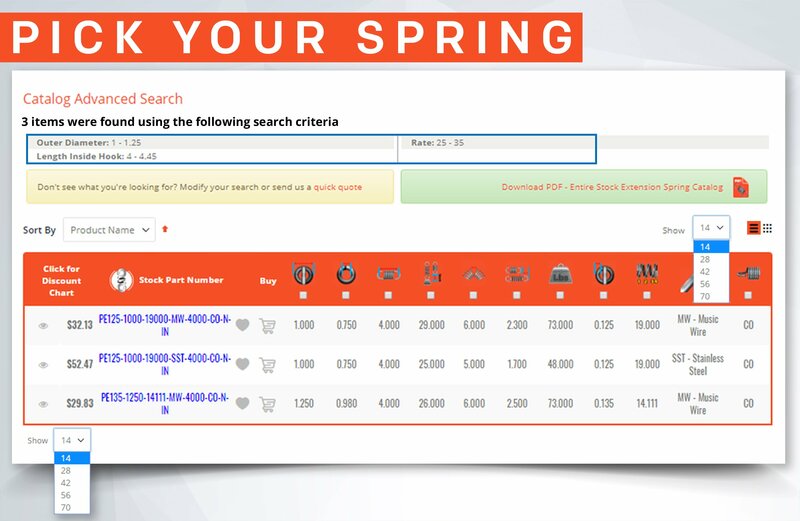 You must base your extension spring selection on these values because through these values you're able to see whether the spring will fit into your application, if it is strong enough, and if it will meet the required working loads. To calculate the working loads, you must focus on the spring rate and the initial tension as shown in the example formulated below. Example - You have a spring with a spring rate (k) of 7 newtons per millimeter (N/mm) and an initial tension (IT) of 40 newtons (N) that must travel (T) 25 millimeters (mm). Follow the provided formula to calculate the load (L).